N. Steven Harris | Innovation, Inspiration... Atlas Unleashed! 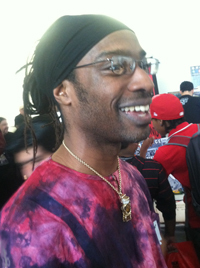 N. Steven Harris has had a career spanning 20 years in the comic book industry. Mr. Harris is an alumni of the School of Visual Arts in Manhattan, NY where he majored in illustration. His highlights include Aztek: The Ultimate Man, a character which he co-created along with Grant Morrison and Mark Millar. Mr. Harris also illustrated several Batman related titles for the Batman: Officer Down storyline including ‘Robin’, ‘Catwoman’ and other storylines for ‘Black Lightning’ at DC Entertainment. Mr. Harris’ collaboration with writer Mike Baron graced the entire run of Motown Machineworks’ ‘The Crush’, displaying the depth of his artwork. His work for Marvel Entertainment has included ‘Generation X’, ‘X-Force’ and ‘Deadpool Annual 1998’. Mr. Harris is also an accomplished creator of his own properties and concepts. These include his own creation for the Independent comics market, ‘The Brotherhood of the Fringe’ as well as co-creating several titles with others including: ‘Ajala’ with writer Robert Garrett; and ‘Crimson Rose’ with Mark Mazz and Grey. Most recently, Mr. Harris collaborated with best-selling novelist L.A. Banks of “The Vampire Huntress Legends” series on a comic book adaptation of the 12th book in that series, published by Dynamite Entertainment. When he is not doing comics or teaching young people through arts organizations, Mr. Harris does storyboards for advertising agencies like Ogilvy & Mather and Berlin Cameron, and products like Samsung, and Glaceau Vitamin Water. He also has participated in gallery shows showcasing comic book art around the United States and one in Japan.